The Merriam-Webster online dictionary defines "improvising" as the act of making or creating by using whatever is available. 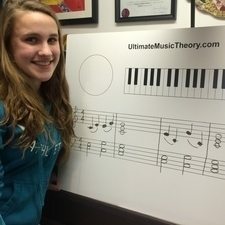 I never thought that I could improvise, let alone teach improvisation, until I realized how easy it was to teach improvising with triads! 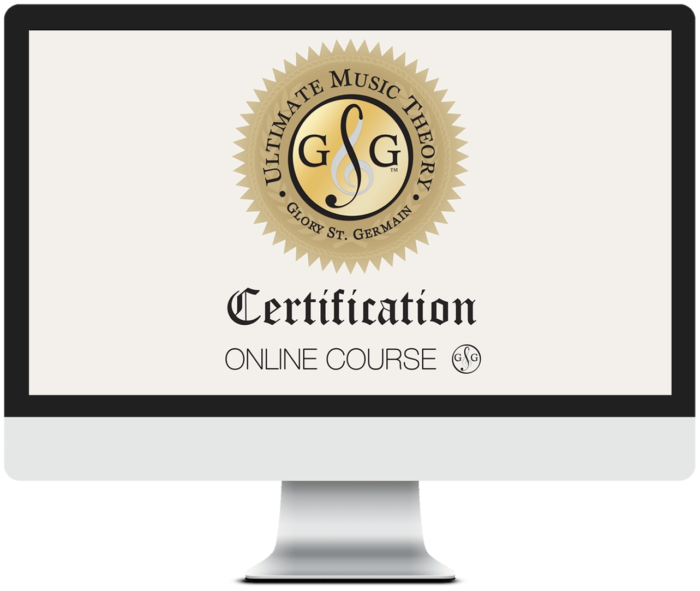 This blog is yet another of my True Stories on how I used Ultimate Music Theory to save the day - well, to at least save the lesson and my sanity! Alas, I do have students who do not practice and who sometimes leave all their "playing books" on the piano by accident...or accidentally on purpose. I know when their UMT Tote Bag is handed to me and it is as light as a feather, it is probably missing a book or two. Thank goodness that I have encouraged my students from week #1 to put their Theory Workbook back in the bag as soon as they have finished their theory assignment. Thus, we usually have a Theory Workbook in our Tote Bag when they arrive for their lesson. So - how do you save an hour's lesson when all the Student has is their Ultimate Music Theory Basic Rudiments Workbook? Easy! You teach improvising with triads! Did you feel a rhythm pattern taking shape? Did you hear an idea for melody? Did you get inspired to try Improvising with Triads? Tonality - What mood are you feeling for your Improvisation? Will it be happy? If so, use a Major triad. If you are feeling sad or mad, try a minor triad. Time - What Time Signature do you want to use? Are you feeling like dancing (3/4) or marching (2/4) or just boogie woogie beating (4/4)? Triad Pattern - Select your triad pattern. Keep the pattern simple. A 2-measure pattern is easy to play (and repeat) in the Bass (if you decide that your Right Hand will play the melody). Improvising with Triads Step 2 - Take it to the Piano! Place your Right Hand on the Pentascale Pattern that corresponds to your Triad and Tonality. Play your Triad Pattern several times with your Left Hand. When you are ready, start adding notes from the Right Hand Pentascale. Keep it steady. Keep it simple. And VOILA! You are Improvising with Triads! How cool is that! The notes of the Pentascale will complement the Triad Pattern too, so there really is no "right or wrong" improvisation. 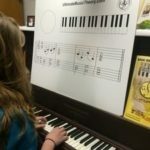 Transcribe: For added fun, when you find a Melody and Rhythm that you love, write it out on your Teacher Whiteboard. 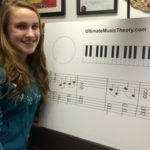 Take a picture of your student posing with their Composition. If you have a music program like Finale, you can also write it out for your student, print it and start their very own Composition Notebook. (I like to keep my student's Compositions in Page Protectors in their Composition Duo-Tangs). Transpose: Take your favorite Improvisation and transpose it into the Tonic Major or the Tonic minor key. Discuss what happens when the tonality changes. Join the Conversation! 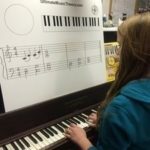 Try Improvising with Triads with your students. Share your experience! Madeline thought that it was going to be really hard. Was she ever proud of herself when she created her first Composition! She even added articulation on her own!